WAILUKU — Chloe Gangnath’s teammates cheered as the Seabury Hall senior accepted the Outstanding Female Athlete of the Meet award from Mayor Michael Victorino at the Victorino Ohana Invitational on Friday night. Her latest performance certainly deserved all the accolades. Gangnath swept all three distance races and helped the Spartans win the 1,600-meter relay at the Yamamoto Track & Field Facility. The reigning state cross country champion won the 1,500 with a time of 4 minutes, 54 seconds, the 800 in 2:22.27 and the 3,000 in 10:59.28. Gangnath also anchored the 1,600 relay to push the Spartans to gold in 4:18.66. Competing and winning the three distance events is certainly a challenge, especially when the competition increases. But history shows that it’s not impossible. The Spartans’ Ava Shipman won all three distances at the state championships in 2017, and teammate Veronica Winham followed suit last season. 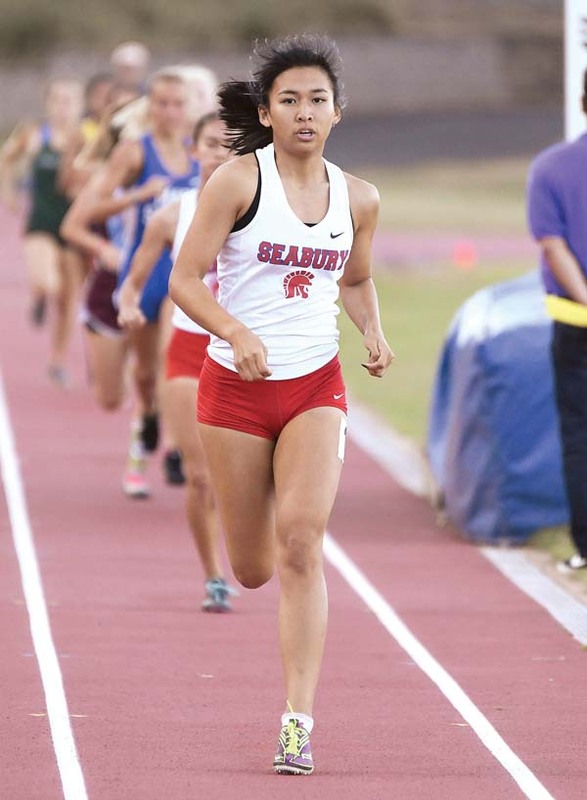 Gangnath hopes to continue the streak at this year’s state meet, which will be held on Maui. Hawaii Baptist’s Johanna Seng is ranked No. 1 in the state in both the 1,500 and 3,000, just a few seconds better than Gangnath. Accomplishing what her Seabury teammates have done before her would be even more rewarding because it would be in front of the home crowd at the Yamamoto. With a score of 160 points, Seabury captured the girls team title for Friday’s meet. Baldwin was second with 86 points, followed by Maui High with 65. In the boys competition, Baldwin won with 221 points, over 100 points more than second-place Maui High. Senior Rey Cadiz was a big part of the Bears’ team effort, getting wins in the 110 and 300 hurdles. Cadiz is the defending state champion in both events. 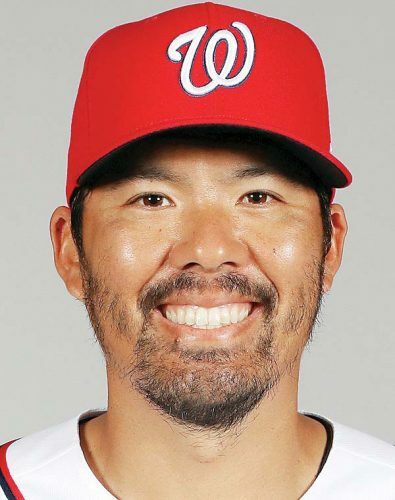 “Rey has become one of the captains, one of the leaders… everybody looks up to him,” coach Keoni Tengan said. After competitors were already warming up for the 110 high hurdles, there was a 45-minute delay due to technical difficulties at the timing booth. But Cadiz kept himself ready to race and finished first with a meet-record time of 14.44. Similar to the 110, Cadiz pulled away from the rest of the competitors in the 300 hurdles, winning gold in 40.51. He also anchored the 400 relay, pushing the Bears to a win in 44.04. Cadiz’s performances earned him the Outstanding Male Athlete of the Meet award. 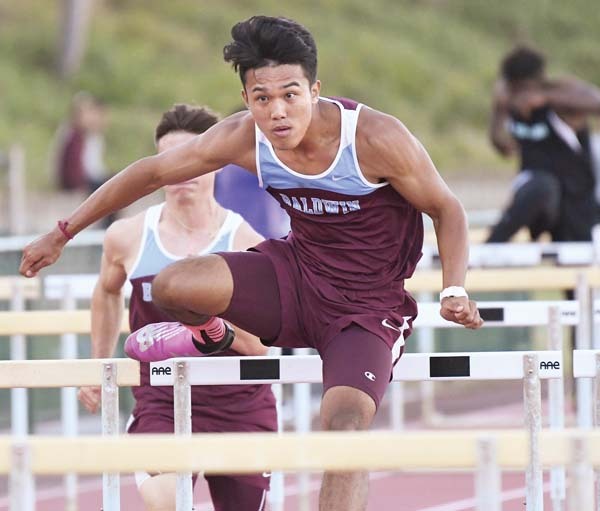 Teammate Michael Rebolledo, who was also on the winning 400 relay team, was the Outstanding Male Field Athlete after winning the long jump and placing second in the 100 and 200 behind Seabury’s Noah Payne — Payne broke older brother Isaiah’s meet record with his time of 10.75 in the 100. The Bears also dominated in the girls field events, with senior Sela Panuve winning high jump (5 feet, 1 inch), the long jump (17 3/4) and triple jump (36-11) on her way to earning Outstanding Female Field Athlete honors. Panuve kept to a specific strategy to make sure she has time to compete at her best at each jump, especially when events begin to overlap. 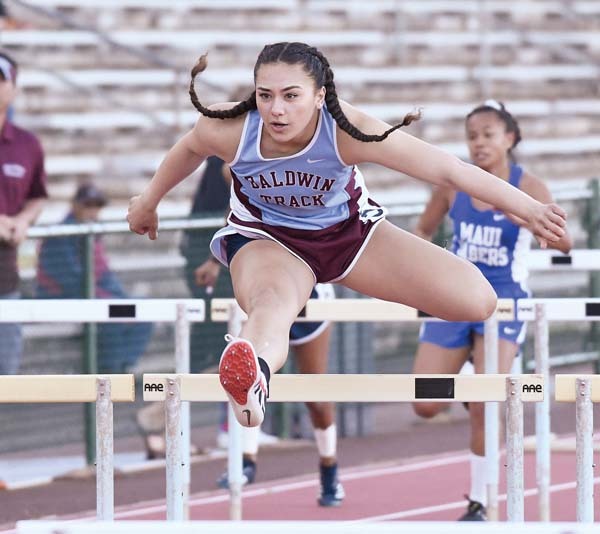 In between it all, Panuve also won the 100 hurdles in 15.58, barely leaning past Seabury’s Ameera Waterford and Anne Wong of Sacred Hearts. During Thursday’s trials, Panuve tied with Waterford with a time of 15.84. Wong trailed close behind at 15.86.